Come and join us for Sunday Morning Worship & Service 10:00am. 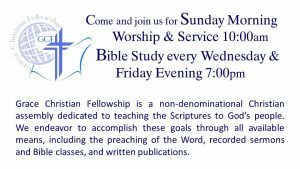 Grace Christian Fellowship is a non-denominational Christian assembly dedicated to teaching the Scriptures to God’s people. We endeavor to accomplish these goals through all available means, including the preaching of the Word from only the Preserved King James Bible, recorded sermons and Bible classes, and written publications.